After months of closure for renovation, Yuri Kuklachev’s Cat Theatre is finally set to resume its operations. This time around, the theatre will be accompanied by a Cat Temple — a place where kindness classes and allergy prevention courses are taught. 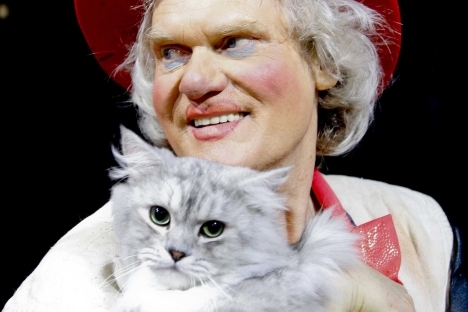 Yuri Kuklachev’s Cat Theatre is ready to reopen its doors to the Moscow public. The studio, run by the legendary animal trainer and clown, had been under renovation for several months. During this time, all of its shows took place at a nearby folklore center. Now, the only cat theatre in the country — and in the whole world, for that matter — is finally resuming its work. In addition, this time its stage and cat kennels will extend into a so-called Cat Temple. It appears that the Cat Temple will resemble the cat cafés scattered all across Asia: it will be a place with plenty of cats to touch and pet. “This is going to be a place where one can simply sit and rest in the company of purring friends,” Kuklachev told RIA Novosti news agency. In addition, the temple — or “the garden,” as it is dubbed — will also provide cats with additional living space that is much more spacious than the tiny enclosures in which the 120 “actors” of the Cat Theatre currently live. The renovation plans for the Cat Theatre were grandiose. About 18 months ago, when the studio closed for renovation, Kuklachev said that the Cat Temple was being designed as an “edutainment” center for both children and adults. Each of the 36 cat breeds at the theatre will live in its own unique environment: the Persians will walk on Persian carpets, the Siberians will inhabit a Siberian-themed area and the Americans will be able to take a stroll on an “island” that looks quite similar to Manhattan. Kuklachev also developed a comprehensive, educational, entertainment program for his audiences, including dog- and cat-training courses, special rods that young temple visitors can use to play with the kittens and counseling sessions for children and their parents, who are allowed to pet the cats as they talk to psychologists. “We will also have respiratory gymnastics for children that are allergic to cats. I have been doing these exercises for years, together with my son Dmitry, who used to be allergic to cat fur when he was a young,” Kuklachev said. Yuri Kuklachev is now 64 years old and has been training cats and performing as a clown for the last 40 years. He was also a child star on Soviet television. Today, his son Dmitry — the very same Dmitry who was able to overcome his allergy with his father’s help and follow in his footsteps as a clown and animal trainer — is now Yuri’s assistant at the theatre. Domestic cats are practically unfit for training — or so Kuklachev argues. The only way to invent a trick with a feline is to play around with it and eventually uncover its unique talents and proclivities, building the trick around their inclinations. “The ‘trick-or treat’ principle doesn’t work with cats. You can only negotiate with them in good faith. For example, if you stop feeding a cat for a day it will develop stomach and liver pains. If you slap it, you will lose its trust. There is no way to bring a cat to its knees,” Kuklachev told Argumenty i Fakty newspaper. In 2009, a group of bloggers led by mathematician Mikhail Verbitsky filed a suit against Kuklachev, accusing him of torturing and abusing his pets. The litigation ended with the deletion of publications claiming to expose Kuklachev’s alleged cruelty toward felines. The plaintiffs also had to offer the animal trainer their apologies and pay damages. Kuklachev’s “unique humane method” was successfully defended in court. The article is a combined report based on RIA Novosti and Argumenty i Facty newspaper.